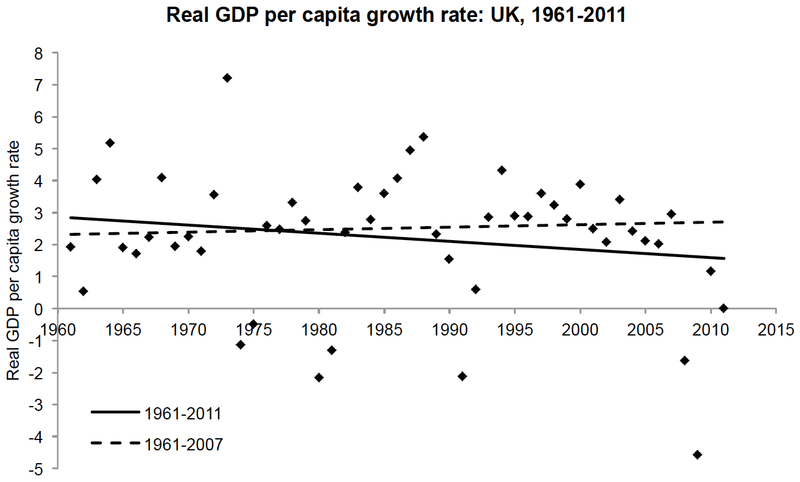 Has the UK been under secular stagnation since the early 1960s? The slowdown in long run growth in the developed economies therefore seems to have become a permanent fact of life, rather than a temporary result of the financial crash that will disappear over time. Averaged across the G7, the slowdown can be traced to trend declines in both population growth and (especially) labour productivity growth, which together have resulted in a halving in long run GDP growth from over 4 per cent in 1970 to 2 per cent now. However, looking at data from the UK in particular, there doesn't seem to be much evidence of secular stagnation in GDP per capita. As the chart below indicates, the linear trend in the growth rate of real GDP per capita between 1961 and 2007 is essentially flat; only when the post-crisis years are included does the slope of the line fall below zero. One possible response is that growth was artificially elevated during the pre-recession boom period. Yet the dashed line would not look any different if it only went up to 2001 or 2002; growth during the mid-2000s was about equal to average growth over 1961-2007. To be fair to Mr Davies, he does admit that the slowdown "looks more persistent for the G7 as a whole than it does for individual countries, where there is more variation in the pattern through time." To celebrate a highly successful Art Auction in the Nuffield JCR last night, I thought it was time for another college-themed post. In particular, I thought a quick graphical description of individuals' total expenditure was the order of the day! Data, which were obtained via this afternoon's email to the social list, are of course strictly confidential. 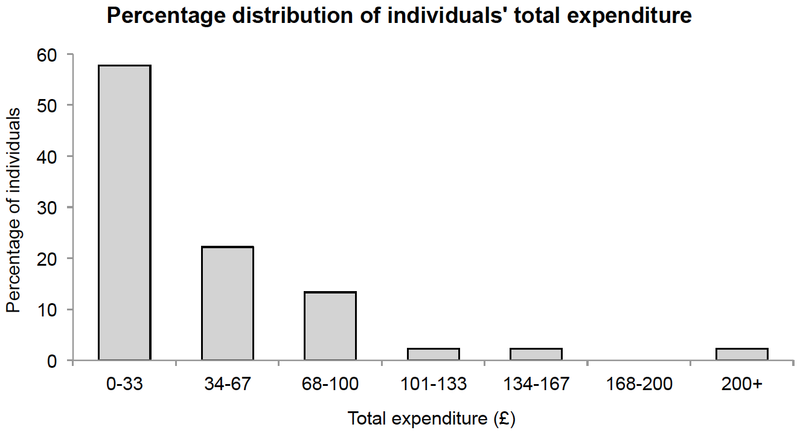 The first chart plots the percentage distribution of individuals' total expenditure (figures were only available on those who spent >£0). As expected based on casual observation, it is strongly right-skewed; most of our bidders spent a small-to-moderate amount, while a few high rollers splashed out rather more. 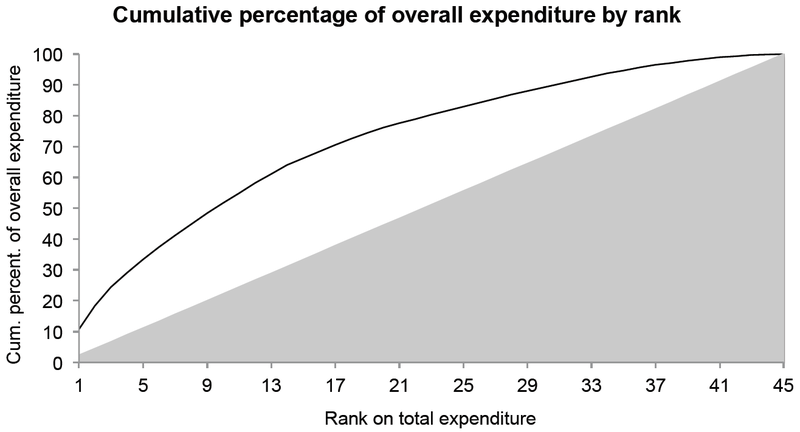 The second chart plots the cumulative distribution of individuals' total expenditure. This allows us to see that, for example, our single biggest patron accounted for 11% of overall expenditure, while our top three accounted for nearly 25%. It also predicts that 2010-2020 will be the first decade since records began that saw a rise in absolute poverty – defined as a household in which income is below 60% of median earnings. A rise from 2.6 million households in absolute poverty to 3.5 million is now expected. Incidentally, it is not obvious whether this error was originally made by the authors of the report themselves and then reproduced by Mr Wintour, or whether it was introduced by Mr Wintour de novo. What sorts of people think comedians should be censored? In recent years, a number of high-profile British comedians have been criticised or actively reprimanded for telling offensive jokes. Examples include: Jimmy Carr, Frankie Boyle, Rob Brydon, Sacha Baron Cohen, Ricky Gervais, Russel Brand & Johnathan Ross, Jack Whitehall and even Stephen Fry. As it so happens, the relentlessly inquiring minds at YouGov have done a poll on attitudes to offensive-joke-telling, which grants us an opportunity to discern what the British public thinks about these incidents. Some people think too much comedy on the TV and radio these days is offensive, while other people think that reacting to complaints is stifling the artistic freedom of comedians. Which of the following best reflects your view? 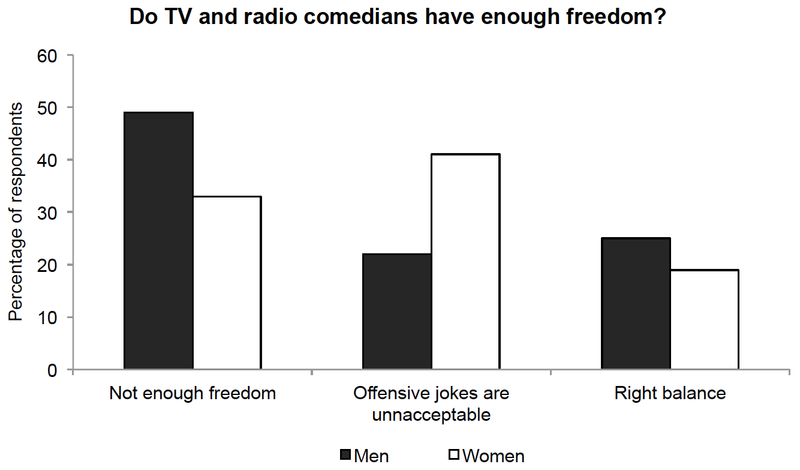 Radio and TV comedians no longer have enough freedom to tell jokes that some people would find risky or offensive. Broadcasters should back comedians against these sort of complaints and if people find them offensive they shouldn't watch. Making jokes about subjects that would offend a large proportion of the general public is unacceptable on the television or radio. Broadcasters should listen to public complaints and make sure that comedy that is liable to offend people is not shown. Television and radio broadcasters currently get the balance between artistic freedom and not causing offence about right. Yesterday's post dealt with the relationship between concern about inequality and actual inequality among OECD countries. 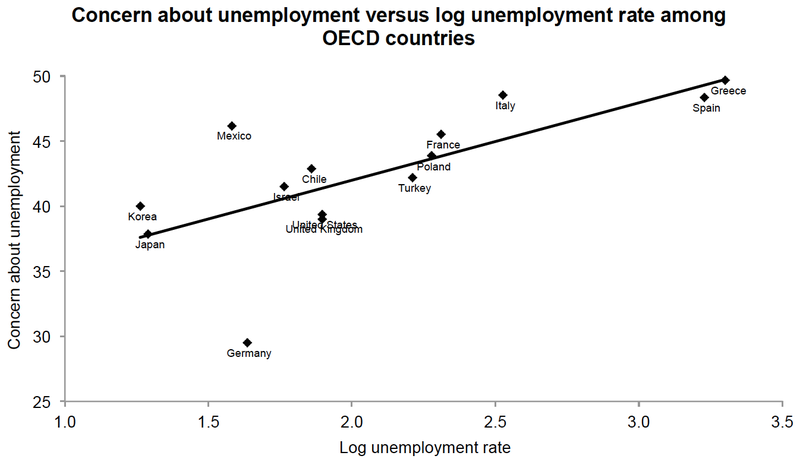 Today's post examines the relationship between concern about unemployment and actual unemployment among OECD countries. As before, data on concern about unemployment are from the recent Pew survey, while data on actual unemployment are from the OECD database. Concern about unemployment is calculated the same way as concern about inequality. The specific question Pew asked was, "Do you think a lack of employment opportunities is a very big problem, a moderately big problem, a small problem, or not a problem at all in our country?" Each value is for Spring 2014. The measure of unemployment used is simply the harmonised unemployment rate for the first quarter of 2014. Because Spain and Greece, with unemployment rates of 25% and 27% respectively, skew the distribution considerably, I apply the log transformation. The chart below shows the relationship between concern about unemployment and actual unemployment. In contrast to the case of inequality, the correlation here is both large and statistically significant, namely r = .70 (p = 0.005). And it is essentially identical when the non-log-transformed unemployment rate is used, namely r = .67 (p = 0.009). Moreover, it is even stronger when Germany, which appears to be something of an outlier, is excluded from the analysis, namely r = .80 (p = 0.001). 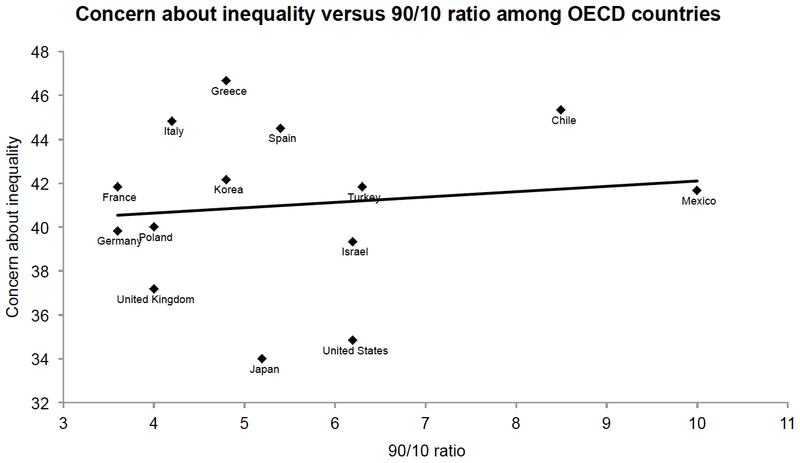 This post examines the relationship between concern about inequality and actual inequality among OECD countries. Data on concern about inequality were taken from a recent international survey conducted by Pew Research. Data on actual inequality were taken from the OECD statistics database. In their survey, Pew asked respondents in 14 OECD countries (as well as a number of non-OECD countries), "Do you think the gap between the rich and the poor is a very big problem, a moderately big problem, a small problem, or not a problem at all in our country?" To measure concern about inequality, I take the weighted average percentage of respondents who think inequality is a problem, assigning the weight '3' to answers of "a very big problem", the weight '2' to answers of "a moderately big problem", and the weight '1' to answers of "a small problem". Each value is for the year 2013. I utilise two measures of actual inequality: the post-tax, post-transfer Gini index, and the ratio of disposable income at the 90th percentile to disposable income at the 10th percentile (the 90/10 ratio). Each value is for the latest available year (typically 2011 or 2012). The correlation between the two measures is very strong, namely r = .95 (p < 0.001). 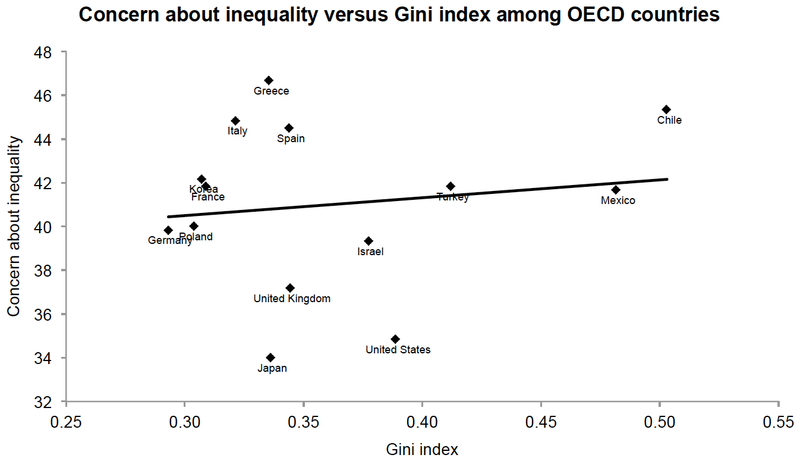 The first chart shows the relationship between concern about inequality and the Gini index. The correlation is positive but very small and non-significant, namely r = .14 (p = 0.6). The second chart shows the relationship between concern about inequality and the 90/10 ratio. Again, the correlation is positive but very small and non-significant, namely r = .12 (p = 0.7). A major caveat, of course, is that rather few countries are included in the sample. On the other hand, the sample does encompass almost the full range of inequality among OECD countries, from Germany near one end of the spectrum to Chile and Mexico at the other. Japan is one of 22 nations and the only developed country--Apart from America, where it is falling out of favour--that retains capital punishment. Contrary to this statement, I count at least four other developed countries that retain capital punishment, namely: Singapore, Taiwan, South Korea, and Qatar. Whilst Qatar and South Korea may have not have used the death penalty for some years, it remains a legal form of criminal punishment in those countries. Both Singapore and Taiwan have reportedly executed people as recently as this year. The UN rates all three of Singapore, South Korea and Qatar as having "very high" human development; indeed in the latest index, Singapore and South Korea are ranked above Japan. Taiwan is reportedly not included in the HDI, but the Taiwanese government has calculated that if it were, it too would would have "very high" human development.